With only days to go before the Narayanganj City Corporation polls, the chief designer of the electronic voting machines has brushed aside concerns over the reliability of the machines. �There is no way to hack into the machines or rig the vote,� said Dr SM Lutful Kabir of Bangladesh University of Engineering and Technology (Buet), who oversaw the designing of the machines. In 2005, three ex-students of Buet -- KM Masum Habib, now lecturer at the Institute of Information and Communication Technology (IICT) at Buet; Rajib Mikail, lecturer at the university's electrical and electronic engineering department, and Mahmudul Hasan Sohag, founder and director of Pi Labs, a research and development company -- worked under the supervision of Dr Lutful Kabir to design the machines, now popularly known as EVMs. The EVMs underwent live testing at the Chittagong City Corporation elections on June 17 last year. They were successfully used at 14 polling stations. The machines face their biggest challenge yet at the Narayanganj polls, where 1.48 lakh of the altogether 4 lakh voters will cast their votes through using the machines at 58 polling stations. The move has led to doubts and opposition among many quarters, including the main opposition party BNP. Those with reservations about the machines say the EVMs are not reliable as they can be tampered with in different ways. For instance, they say, fake votes can be cast with mobile phones if an EVM comes equipped with Bluetooth, an open wireless technology for exchanging data over short distances from fixed and mobile devices. Some candidates in the Narayanganj polls, including Selina Hayat Ivy, a leading mayoral contender, have also expressed doubts over electronic voting. She believes the system may frighten many voters. Dr Lutful Kabir, also director of IICT, believes the concerns seem much deeper as the stage set for the EVMs is now bigger than ever. �Some 22,000 people cast votes with the machines at the Chittagong elections. The number is well above one lakh this time. This could be a reason behind the concerns,� he said. To tamper with the machine, one would have to break it open and change its innards, he said. �How do you expect to do that with five-hundred odd machines? Do you expect the law enforcers to sleep while you do that?� Dr Kabir asked. Explaining how an EVM works, he said the battery-run machine has two components -- the ballot machine and the control unit. The ballot machine looks exactly like a ballot paper, the only difference being that it is fitted with buttons. The names of the candidates are clearly written on the machine's face alongside their symbols. To cast his or her ballot, a voter simply needs to press the button beside the candidate's name and symbol. �A green light will flash beside the button along with a loud beep to inform the voter that the vote has been cast,� said Dr Kabir. The whole process takes less than a minute compared to five minutes in the traditional voting process. In Narayanganj, each booth will have three ballot machines -- one for the mayoral candidates, one for the councillors and one for the reserved-seat female councillors. Votes can be cast only once in each of the machines. The voters also have the option to cast a blank vote by pressing a button titled �final� on the ballot machine. Each set of votes triggers a change in the counter on the control unit, the other component of the EVM. The counter shows the total number of people who have cast votes. However, nobody can see which candidate has polled how many votes until voting is officially closed. To begin voting at the start of the day, a master card needs to be punched into the EVM's control unit. The assistant presiding officer will have the master card, and votes cannot be cast unless that card is inserted. This way, Kabir explained, if there is any commotion at the polling station, the officer can simply take out the master card so that nobody can cast fake votes. The actual voting results are kept inside the machine, which is protected by �four layers of security�. There is no way all four layers can be breached at the same time, he added. 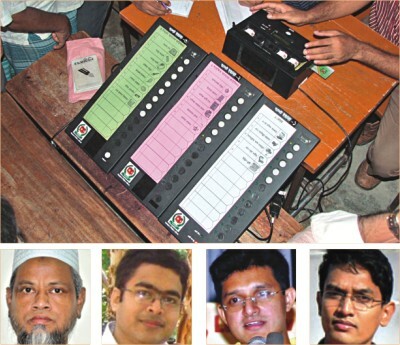 Some 508 EVMs are being delivered to 450 booths at 52 centres for the Narayanganj polls. Each of the units costs Tk 36,000. A major challenge for the EVMs is the fear of technology among general voters, said Abdul Baten, deputy secretary at the Election Commission. �Many voters are afraid that the system may prove too complicated, while some others find it difficult to trust a machine with their votes,� he said. However, the EC official added, once the voters realise that all it takes is pressing a button to cast votes, they will see the simplicity of the process. Looks like these machines have a huge fault. They seem to not provide privacy to the voters. It is the right of the voter to keep his vote secret for his own safety. My question is can our illiterate voter use it? I think voter requires training before voting. My second question how we believe this system while we have vote rigging. Political situation is not good enough, also our people not having enough knowledge about EVM, so no need of EVM.